As I am currently doing some research now on the Geneva Convention and the treatment of prisoners of war I thought that this book might be handy. 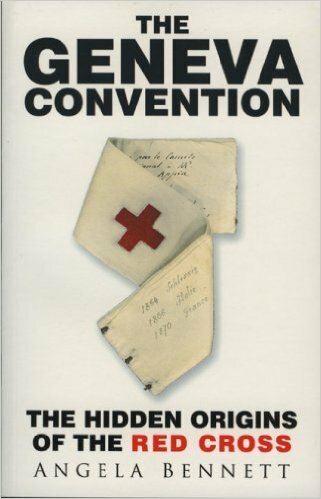 It is a good (not a great) history of the circumstances surrounding the original Geneva Convention, the Red Cross and the evolution of law regarding warfare prior to WWI. The writing is OK, although there is some layout and grammar issues (such as the use of a period where a comma would be more appropriate and compound words divided into two words by means of a hyphen) but these do not distract from the story of Dunant and the original founders of the Red Cross. In fact, Dunant is such an eccentric character it would be hard not to write about him in a way that makes him interesting. The main problem with the book comes from the way it is framed... literally. The Introduction does not simply give the reader an oversight into the topic but rather rambles off into an attack on Alberto Gonzales, the Attorney-General (in this case a hyphen is warranted but missing) of the United States. He is described as a "religious Texan," as if that is somehow relevant to the point she is trying to make. She describes the detention facility built for terrorists at Guantanamo Bay as a "concentration camp" (it isn't). And she was critical about Gonzales' description of the Geneva Conventions (as applied to terrorists) as "quaint." But at least the introduction is mercifully short. However, Ms. Bennett can't leave it at that. In the last chapter she goes back to bashing the U.S. treatment of terrorists at Guantanamo. She is angry that Flex Plexico (actually, Lt. Cmdr. Flex Plexico, USN) has the nerve to deny that detainees are mistreated with the "equivalent" of torture. She notes that 15 articles of the Geneva Convention are not being observed at Guantanamo Bay... according to the UK Guardian. Apparently, Gonzales disagrees with the US "Ministry of Justice"(sic) as to whether or not detainees deserve the protections that captured soldiers do. Ms. Bennett, described as a "historian of the Red Cross," fails to note the Geneva Conventions put into play in regards to "irregular warfare." Because of Prussia's experiences during the Franco-Prussian War, which saw French civilians arming themselves with shotguns and other firearms and shooting at German soldiers from windows and other ambushes clauses were put in which described "illegal combatants." These fighters, who have no uniforms, no national symbol, no identification papers, do not get the same protections as regular soldiers. With that being said, the United States of America, which lost thousands of civilian lives on September 11th, 2001, has graciously used the provisions of the Geneva Conventions as a yardstick for the treatment of detainees. Sorry, but the detainees can't have a canteen as laid out in Article 28. The detainees food is prepared by the same people who prepare the guards food but with Islamic dietary restrictions in mind (Article 26)... with the exception of those detainees attempting to hunger strike so when they die their lawyers can claim they were murdered. Respect for persons and honor is irrelevant (Article 14)... these are murderers and thieves and if you doubt that I'm sure you can find some beheading videos on YouTube. I can refute or discuss any or all of the articles she claims are not being complied with but it would take too long. Needless to say, this is like eating a plain chees sandwich between two moldy pieces of bread. If you ditched the liberal hand-wringing at the beginning and end and just concentrated on THE ORIGINS OF THE RED CROSS it would make a decent book.